People’s Bank has launched an exciting promotional campaign for its credit card holders, which adds more value to their lives through amazing discounts at leading lifestyle stores. The promotion ends on 31st October 2018. People’s Bank Credit Card holders can swipe freely and pay monthly in addition to enjoying a 0% interest plan up to 36 months. People’s Credit Cards offer the lowestinterest rate and fee structure, making it the preferred credit card in the country. Furthermore, the Bank’s vast network of over 730 branches makes bill settlement extremely simple. Customers can also avail themselves of People’s Bank’s advanced Mobile and Internet banking facilities. 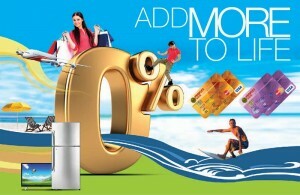 People’s Bank Credit card holders can enjoy 0% interest plan up to 36 months for purchases made with PB Credit card: Abans, Damro, Softlogic Lifestyles, Softlogic, Mobitel, Hameedia, Camera.LK, Wasi.lk, mySoftlogic.lk, People’s Travels, Crazy Jets, Insureme.lk, Buy Abans.lk, Arpico Furniture, SoftlogicMax, Dinapala Group, W.A.De Silva & Co, VisionCare Optical Services, Fitness Connection, bigdeals.lk, takas.lk, findmyfare.com, IBSL and People’s Insurance. Call People’s Bank Call Centre on 1961 to initiate installment plans to add more to life! Since its inception 57 years ago, People’s Bank has opened its doors to customers across the country, from all walks of life, providing them with banking services that meet their unique needs and uplift their lives. People’s Bank currently serves over 16 million customers through 740 branches and its connected network of over 4000 ATMs linked to the Lanka Pay gateway. The bank also continues to play an important role in encouraging various industries including agriculture, real estate, commercial development, small and medium enterprises and exports and this in turn has helped support communities across the country. People’s Bank has always been a driver of financial inclusivity and was also the first bank in the country to commence bilingual operations in Sinhala and Tamil, and thereafter introduced Sri Lanka’s first trilingual cheque book.